Media Digital Ventures holds multichannel advertisement assets across all main media groups in the market:this allows us to provide several media assets types to a single start-up in search for Brand Awareness.Media Digital Ventures enables startups to achieve a greater and better branding impact through multimedia campaigns. We manage advertising stocks from the main media groups to exchange them for equity in scalable, high-growth companies. 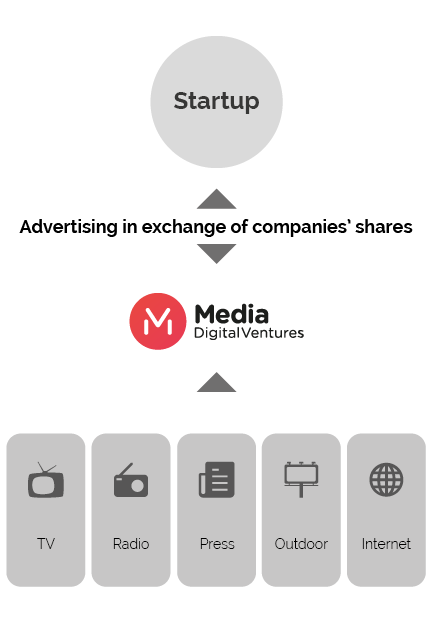 Media Digital Ventures offers start-ups a unique media advertising mix. What is Media for Equity? Media for Equity (M4E) consists in helping start-ups grow by means of strong branding campaigns, obtaining start-ups’ equity in return. The M4E format offers a funding option to newly founded companies and to those going through the growth stage with a proven business model. This helps start-ups achieve fast and sustainable growth, leveraging their leadership in the industry in which they operate, and increasing their possibilities to expand into international markets.